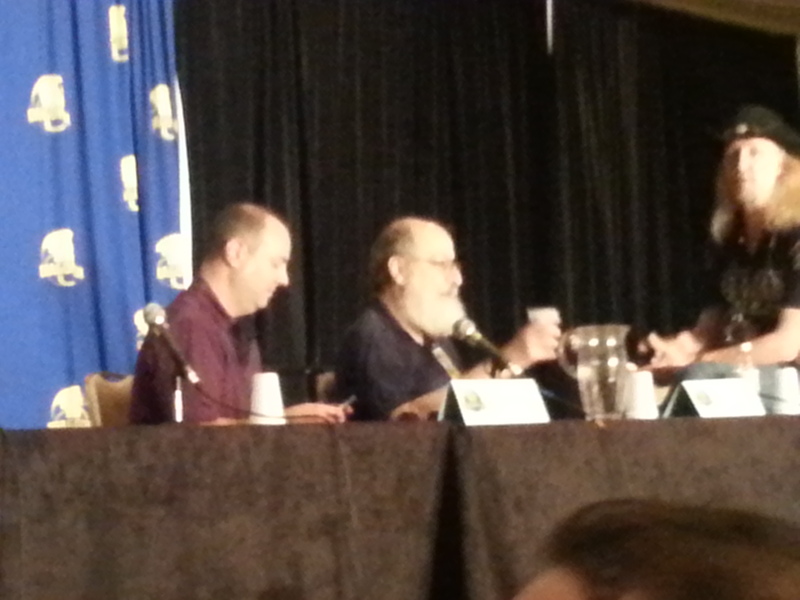 Dragon Con 2014: Harry Turtledove Q and A, and The Big Things Panel. 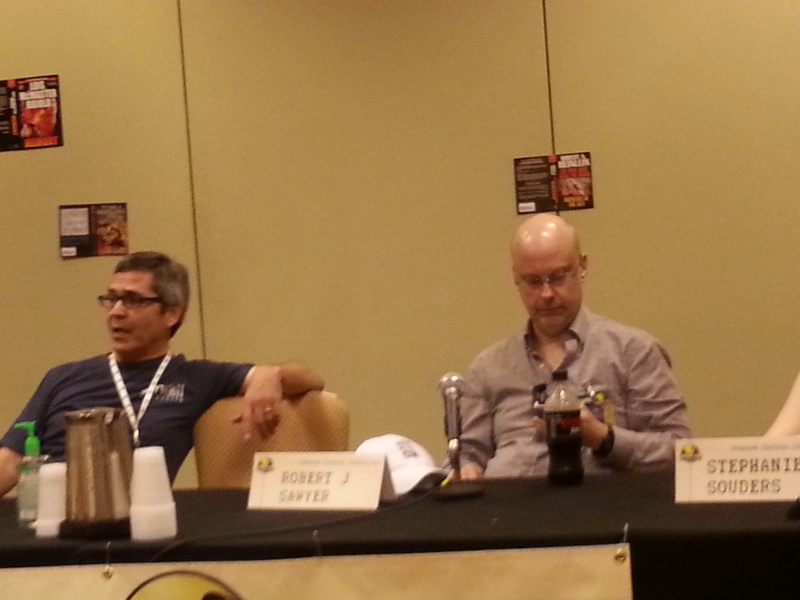 Of course there are a lot of things to do at Dragon Con, but with my age and energy level, the panels are my favorite. I get to sit down and take a load off, as well as get to see and hear some of my favorite authors. Some might be a panel featuring a single great author, like Literary Guest of Honor Harry Turtledove, seen above with my good friend, Van Allen Plexico, who always seems to get the sweet gigs (last year it was Larry Niven). I have always loved Harry Turtledove, from the first book of his I read, Guns of the South, and was fascinated by the entire alternate history concept. I really loved the Balance series, about aliens invading the Earth at the height of World War Two. Then his series about the South winning the Civil War, reaching up to WW1 and through to WW2. And his series about World War Two fought in a land of magic. 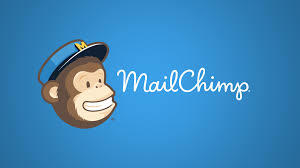 And his…. Well, it goes on and on. I was afraid that his Q and A session would be packed, as Niven’s had been the year before, and there was a long line reaching around the Hyatt. There was not much of a line for Turtledove. I got to the end of the line and was talking to someone who said that he didn’t think the young people got into Harry. Just at that moment a young lady, who couldn’t have been more than seventeen or eighteen, maybe younger, walked up and asked if it was the line to Turtledove. So he does get some younger fans after all. There were only about fifty to seventy-five fans in the room that could have seated ten times more. But Turtledove was gracious and humorous, the people there seemed to be knowledgeable and attentive, and a good time was had by all. I was very impressed by Harry, about how he had gotten out of school with a PhD in Byzantine History, and had great difficulty in getting a permanent position. About how he came across some of his ideas by accident or chance. How a combination of talent, imagination and luck led to his great career, the same factors as most successful authors. And he dropped hints on what is to come. Harry Turtledove is not going to sit on his laurels. Just like Niven the year before, he has plans to keep on working into the future. Speaking of Niven, one of the best panels I saw dealt with one of his favorite subjects, Big Things in Science Fiction. 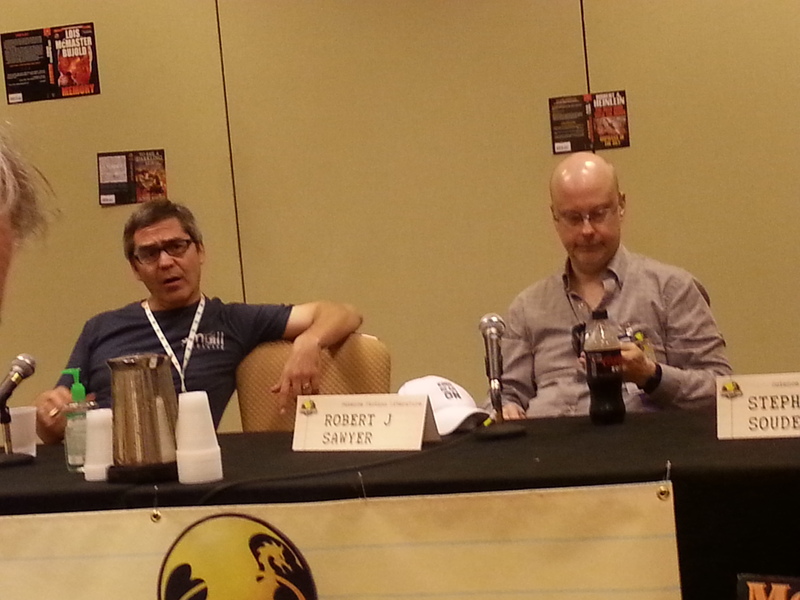 Science Fiction writers Robert J Sawyer (Hugo and Nebula) and Chuck Gannon (Nebula nominee). both authors I am proud to call friends, were on this panel, along with a real NASA mover in Sam Ortega. The subject was some of the biggest objects in the world of Scifi, including Niven’s Ringworld. Huge space habitats, massive ships. moons that were really vessels (that’s no moon.) Expert opinions on experts in the field. People who love the same literature that I do, and love to talk about it. I got a couple of good pictures of Sawyer and Ortega, but missed Gannon. I talked with Chuck and Robert a bit after the panel, and saw Robert later in the Amerimart, getting a book and having it signed, my new hobby. Unfortunately I didn’t get to Chuck’s signing, but I will see him again next year at LibertyCon, and maybe even share a panel with him (I can always hope). And I look forward to Dragon Con now to meet with these gentlemen, and others like them, on a yearly basis. ← Dragon Con 2014: The Wrath of Con.